As a fundraiser for Public Glass and in conjunction with Gump's in San Francisco, I did a show, artist talk and demo recently. 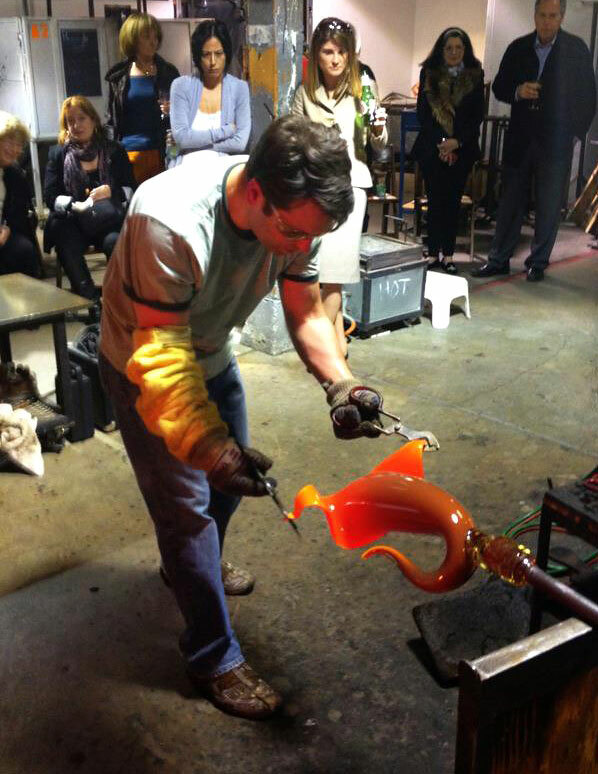 The event was hosted by the Patron's Circle of Public Glass--a group of passionate supporters of the organization. The PG gallery was filled with a range of work and I gave a short talk with a Q&A covering my start in glass (at Public Glass), inspiration for colors, patterns and forms, influences and lots on "how in the world do you get the glass to..." Then we all went back to the hotshop and Michael and I made some ballotini cane and then a Bloom with an exterior in gold and interior of white threaded murrine against black (which eventually went to Stewart Fine Art in Boca Raton). The Patron's Circle were great hosts and there was excellent food and adult beverages. Fun times!